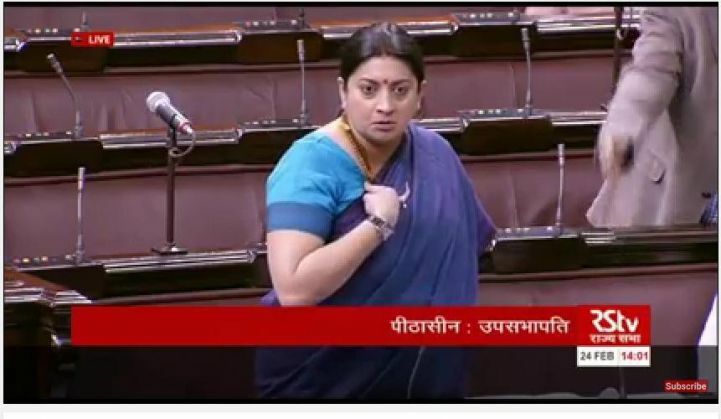 HRD Minister Smriti Irani today single-handedly managed to outdo the combined attack of the Opposition on the JNU and freedom of speech debate in the Parliament today. Here's a blow by blow account of the debate. The suicide of Rohith Vemula, which the Opposition claims to be an institutional killing due to his Dalit identity. The slapping of charges on JNUSU president Kanhaiya Kumar for allegedly organising a pro-Afzal Guru event in JNU on 9 February. The Rajya Sabha couldn't function because BSP supremo Mayawati insisted on having two separate debates on the Rohith Vemula issue and JNU. However, in the Lok Sabha, both the issues were debated. The Congress charge was started by Jyotiraditya Scindia, with vice president Rahul Gandhi strategically seated right next to him. Scindia was countered by BJP leader Anurag Thakur. The duo resorted to the over-used arguments of Nathuram Godse's assassination of Mahatma Gandhi and Indira Gandhi's imposition of Emergency to discredit each other. While Scindia asked why BJP MP Sakshi Maharaj wasn't charged with sedition for calling Godse a patriot, Thakur recalled the crackdown on media during the Emergency to bring home the point that Congress wasn't a paragon of free speech either. Luckily, for those who value free speech and liberal values, TMC leader and grandnephew of Subhash Chandra Bose, Sugata Bose, and BJD's Tathagata Satpathy drilled some sense into the debate. They pointed out that the Congress and BJP were reducing issues of national interest to a political tennis match. Talking about the 'idea of India', Bose said that it is not so brittle that it would crumble in the face of few slogans. In conclusion, he invoked the brand of nationalism that the likes of Sri Aurobindo and Rabindranath Tagore endorsed and said that the idea of nationalism should have a liberating aspect, not one of oppression. Satpathy, with his sharp and witty jibes at the BJP, perhaps proved to be the most formidable to the saffron party. Bringing into focus the depreciating rupee and the humongous amount of bad loans given by India's banks, he said that it was not Afzal Guru, but the failure in governance which prompted the government to seek shelter behind students' agitations and the Jat quota stir. Many others followed. MIM's leader Asaduddin Owaisi said he was opposed to the kind of anti-India sloganeering that was on display at the JNU campus. However, he questioned if sedition charges will be slapped on Kashmiri youth shouting similar slogans in the valley. "In Srinagar, such slogans are raised every day, will you lock up entire Srinagar? ", he asked. BJP ally LJP's Chirag Paswan, while condemning the slogans, criticised the government for its high-handed treatment of the issue. With a united Opposition stacked against her, an emotional Smriti Irani came prepared to rebut every point with documents. She took on all allegations against her and her government - from the way police cracked down on students, to political interference in administrative matters of universities and finally the saffronisation of education. Accusing the Congress of practicing "political opportunism" over Dalit scholar Rohith Vemula's suicide, Irani wanted to know the whereabouts of Congress vice president Rahul Gandhi when more than 600 students died during the Telangana movement. "Did Rahul go once? No. Have you ever seen Rahul Gandhi going to one spot twice? No, never. He saw a political opportunity here," she said. "Indira Gandhi too lost in elections, but her son never supported anti-India slogans," she added. Irani used two documents in particular to counter the Opposition's charge. She extensively quoted from a pamphlet on the Mahisasur Martyrdom Day which was apparently penned by SC/ST/OBC, minority students of JNU and a teacher's manual written by social activist Teesta Setalvad. She dared if Sugata Bose would endorse the "communist view" of Durga Puja which considers it to be a "racial festival", demonising Durga and deifying Mahisasur. Irani also read out portions from Setalvad's manual for teachers, which Irani claimed was commissioned by then HRD Minister Kapil Sibal under the UPA regime. The book meant for students of Class 4 talks about anti-sikh riots, Hindu-Muslim clashes, separatism in Kashmir, Hindu-Christian clashes in Kanyakumari and paints Shivaji in a negative light. "You are teaching this to a child of fourth standard. This is what they call secularism." 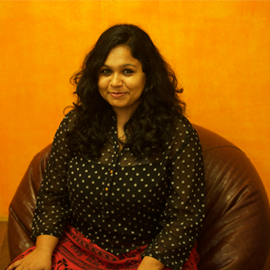 She added: "Siksha ko ran bhumi mat banayo". The Opposition was left speechless and without any ammunition to launch a counter-attack on Irani. Home Minister Rajnath Singh concluded the debate praising Irani and stating that he had nothing to add to what she had already said. While not directly commenting on the JuD chief Hafiz Saeed's fake tweet controversy, he said: "JNU is a centre for excellence, not a den of anti-nationalism." He added: "Though sedition charge on JNU students is not the topic of debate here, as it will be decided by the court, I assure the House that no innocent will be punished or harassed by police, but the guilty will not be spared." READ NEXT >> Nation wants to know: How can 2782 boys in JNU use 3000 condoms daily?